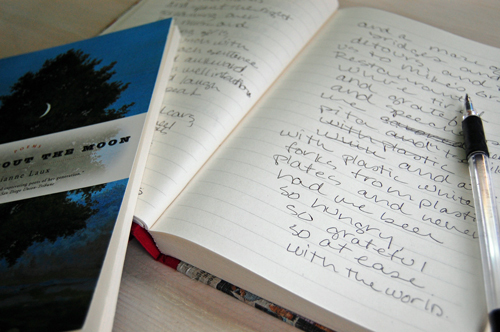 Influenced by Julia Cameron's The Artist's Way, years ago I wrote Morning Pages — a freewwrite filling two full pages, every morning. Most days the pages filled fast, and I started the day doing what I do best and enjoy most: writing. What I always do, no matter what, is what I call my morning reading and writing. I read someone else's work, then write something, anything. It's usually junk, but sometimes a jewel finds its way onto the paper. And even the junk feels like an accomplishment because it's writing. I like this idea because it establishes a time and place for writing. In doing the same thing everyday, I am making an appointment and declaring the importance of writing in my life. And in reading the work of others, I am prepping my write mind. With Molly's nudge, this morning I read Facts About the Moon, poems by Dorianne Laux, and then wrote fast and fevered, without thinking. What a great way to start the day! I was reminded how powerful morning writing can be. Reading and writing first thing sets a tone and pace for everything that follows. Try a Morning Read & Write, and let me know how it goes for you.